So, to keep myself active in the game, i rejoined some of my old ATC groups. For those who do not know what ATC is, here is a brief explanation on wiki. The theme of this month was "in the style of your favorite artist". 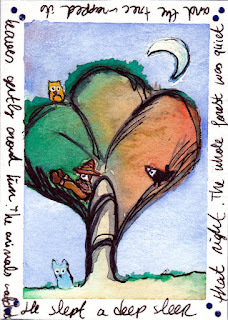 So i made a tiny watercolor in the style of Ivan Gantschev, my favorite children's book illustrator. I really wish I could meet him. He is from Bulgaria but is living in Germany for many years now. I think in Berlin. Anyways, here is my tiny ATC, first one of 2012. I missed making them :) I hope the person I will be sending this ATC to will not see it yet. I like the element of surprise in mailart and ATC's. Anyone up for a trade? It has been a long time since I wrote my last blog. What made me want to write again are the reactions i still have been getting for my two blog entries about Alia Rachmanova (Alja Rachmanowa and It arrived!). Apparently there are several people on the internet desperately searching for more information about her. The Russian writer Alia (Alexandra) Rachmanowa (1898-1991) became world-famous with the wonderful trilogy “Love in the Red Storm”. It is one of the most compelling first-account story of the Russian revolution of 1917-and its tragic aftermath for the innocent civilians. It is also the life story of a strong woman who lived disaster after disaster, but picked up the pieces each time and moved on. Alia was born as Galina Djuragin. She chose her pseudonym in 1931 when she published “Love, Tscheka and Death” in Austria. She lived there in exile, hunted by the Bolsheviks, and did not want to cause any trouble for her family whom she had left behind with an autobiographical novel. Alia’s parents were nobles. After the revolution their lives had no certainty. Alia had to quit her studies and the family ran away to Siberia. In Siberia, Alia met Arnulf von Hoyer, an ex-prisoner of war from Austria. He fell so much in love with Alia that he decided to stay in Russia for her-even after the revolution. They got married and in the middle of all the chaos, misery and fear, they managed to create an oasis of happiness. In 1922 their son Jurka was born. Three years later they were unexpectedly kicked out of the country. In Vienna the two academicians tried to build a new life, starting a milk shop. Alia kept a diary all her life. That was for her a vital necessity. She drew several inspirations from her diaries for her books. In the Nazi years, Alia’s books were forbidden, but even more tragic is the fact that Jurka was shot dead towards the end of the war. Alia and her husband had to run away again, this time to Switzerland. Despite all the misery and tragedy she went through her books are filled with an inspiring livelihood.